Also the doctor went through what things the boys could do developmentally and he seemed a bit concerned about Dominic. In fact, he was concerned enough that he wants us to get a speech evaluation done for him. He didn't tell us the specifics but apparently he is on the "low" end of normal and since we have a documented delay (Christopher's speech) in the family, he didn't want to risk missing something. Let me tell you, I left that appointment feeling terrible. Feeling like I must be doing something wrong because both of our boys might be behind. I've since thought that through and I don't believe it to be "my fault", but I do think there are some changes that I can make. For one, we are going to get back to making some attempt at "school" even if it's just coloring or talking about numbers or things a long those lines. I'm currently looking for my book about Charlotte Mason's ideas for preschool so that I can go through that and do a bit more unschool type schooling for this age. For another I'm going to be making some cuts in my social media/blogging/playing online or on my phone time. I don't think that I do it so much, but I know that I'm easily caught up in something. An online discussion on Twitter, a video on Food Network (that quickly turns into 2 or 3 videos), sucked into a blog that leads me to another and another. It's so easy for me to get sucked in to the online world. I'm going to try to limit my phone/social media time to only if the boys are napping. What this becomes is less time the boys are watching SpongeBob or other cartoons. Because it gets really easy for me to just turn it on "for a minute" then I get busy and we are doing nothing. 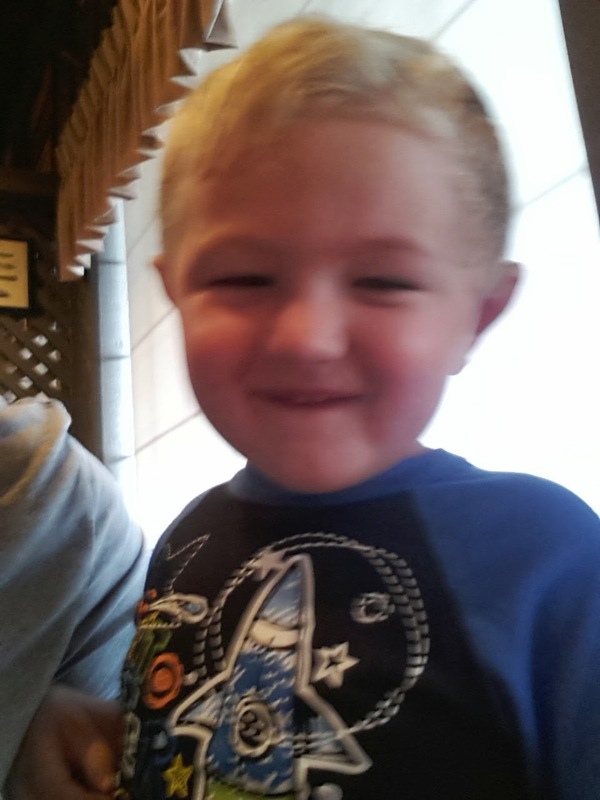 This will help me keep my focus on the boys and playing, laughing, teaching, BEING with them. I hope. So that's my plan, I'm going to try to refocus (it seems like I do this often) on my vocation as wife and mom. I thought about cutting out social media completely, but the truth is that I enjoy the connections that I make. It helps me to feel connected to other Catholic wives and mothers and gives me a community. I won't feel guilty for having those connections and fostering friendships, but that doesn't mean it's OK to neglect my primary duties. And now, to lighten things up a bit, here are some pictures from the weekend! The boys and I went to breakfast at Cracker Barrel without Daddy since he hates it, and I told Dominic "let's take a picture for Daddy" and he looked at the camera and said "hi Daddy!" 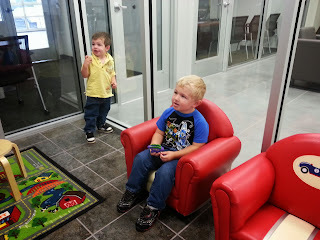 Dominic enjoying the chairs at the Dodge dealer. Also some dinosaur show on PBS that he loved. 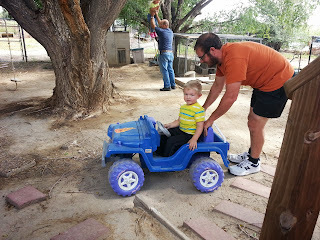 Went to see Aunt Jonnie for her birthday and Dominic loves driving this Jeep around, but mostly in reverse.